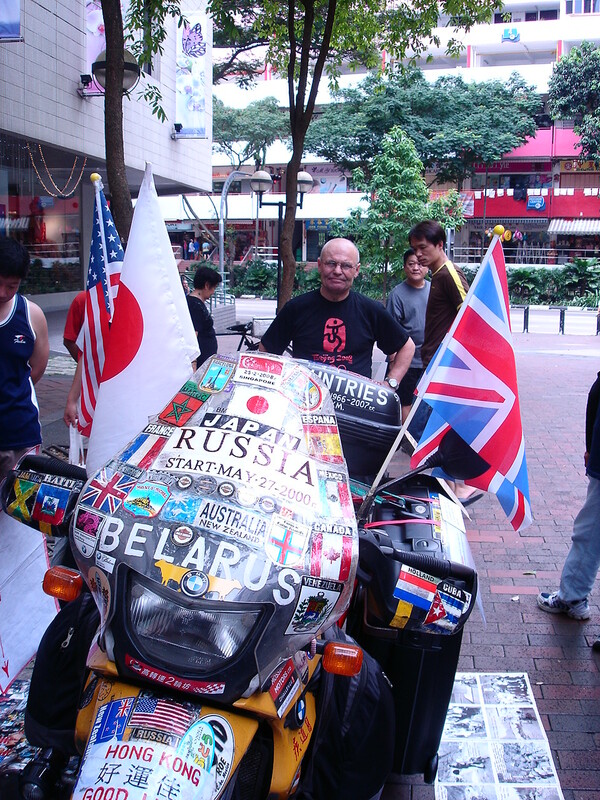 You probably had heard or read about the story of an Englishman who went round the world in 80 days. I met one Russian, a Mr Vladimir Yarets who did something similar when i was in Middle Road last weekend. He had spent 8 years trying to go round the world but has yet to complete his journey. He hopes to get listed in the Guinness Book of Record “to encourage disabled people”. I had a good time going through the many wonderful photographs he took of his journey. What i find more amazing about Vladimir’s feat is he did it despite his physical handicap. Vladimir is a deaf mute. He left Belarus in 2000 and had travelled the world ever since. You can read more about the man here. I dont know Russian nor sign language otherwise, i will ask him how he got his license and pass custom. Vladimir was kind enough to pose for pipit! He went around the world by his bike? Oooooo.. and where does he get the funds from? Amazing!! That takes a lot of guts considering he’s a deaf-mute.